I-10, Vail, and Colossal Cave Improvements: The Arizona Department of Transportation has announced the low bidder for this project. It was awarded to Granite Construction, of Tucson, on the 15th of March, 2019. This project will affect the roads and bridges on Vail/Colossal Cave Road and the SR 83, Mountain View Interchange over I-10. The project is expected to take 550 calendar days to complete. Next steps are the notice to proceed. The contractor will then begin mobilizing and prepare schedules and phasing. More details will follow in the coming months. Union Pacific Railroad to I-10 Construction: Crews continue to work on drainage and underground utilities on the south bound side of Houghton. Equipment and construction crews are in the work zone daily. Please slow down and pay attention. Traffic Signals at Rita, Kolb and Wilmot at I-10: The eastbound off ramp at Rita Road was the first to get the new traffic signal. ADOT decided to accelerate this signal to help reduce the traffic backups on the interstate. From what I have seen it has made a major improvement to that off ramp. Hats off to ADOT and the construction team for getting this done. Work continues on the rest of the intersections. Ramp widening and re-configuration of the striping is under way. The new signal poles should be going up soon. Wilmot and I-10: Work crews should be out once the weather warms up to place the final layer of asphalt along the interstate. That bump on the bridge will be taken care of soon. 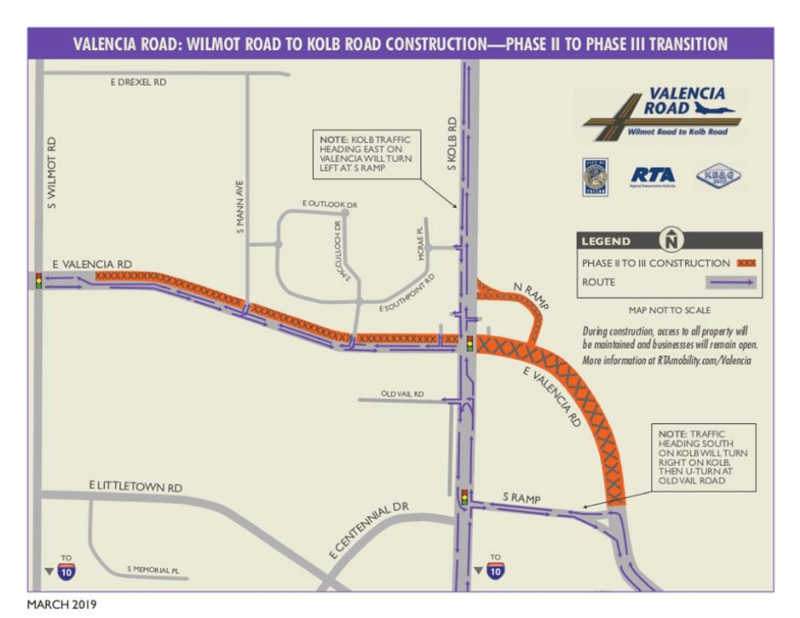 Kolb/Valencia: Valencia Road was closed recently to all traffic east of Kolb. Traffic is using the detour route which is just south of Valencia on Kolb Road.